I have been so proud of my garden for weeks now and how well it has been looking. No real problems with pests. I have done a lot of hand watering in April (our dry season) and a wet May took care of that problem for me. I was so happy with how well my small garden was growing and producing. And then my happiness started turning to sadness. First, my 2 tomato plants, almost overnight went from healthy producing plants, to this. They were attacked by the Southern Armyworm!! I have never seen 2 plants devoured that quickly, but that is the M.O. of those worms. I had seen a few small white moths flying around my garden, should’ve been my first clue, and I was prepared with organic pesticide spray. After seeing all the little buggers on my leaves, I took action! One spraying worked well and I haven’t seen them back on my tomatoes. I have seen a couple just crawling around and I took care of them with the power of the squish. Its been a couple of weeks after these pictures were taken and I lost one of the plants, but one is trying to come back. We will see if it produces again. I do have another bush tomato plant in a pot on the north side of the house and it’s doing well. Second, my pepper plants and flowers around the house were being eaten alive by snails!! Nasty, slimy pest!! They usually feed at night and are very easily controlled with slug and snail pellets. I just have to keep sprinkling it around my flowers and peppers when it rains a lot. And we have had some really hard rains for a couple of weeks. I also noticed them on my strawberry and tomato plants, but after spreading the slug and snail pellets, they are gone. 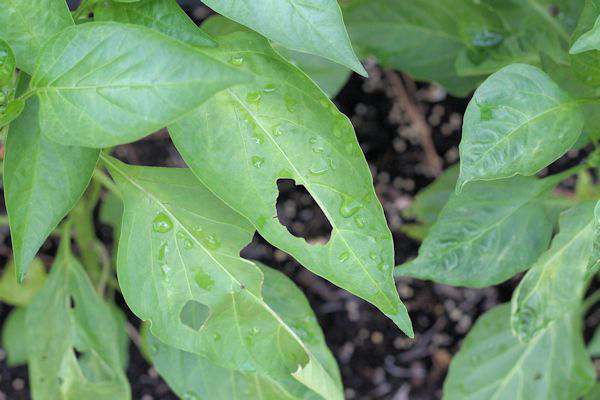 The only real damage was holes in the leaves. 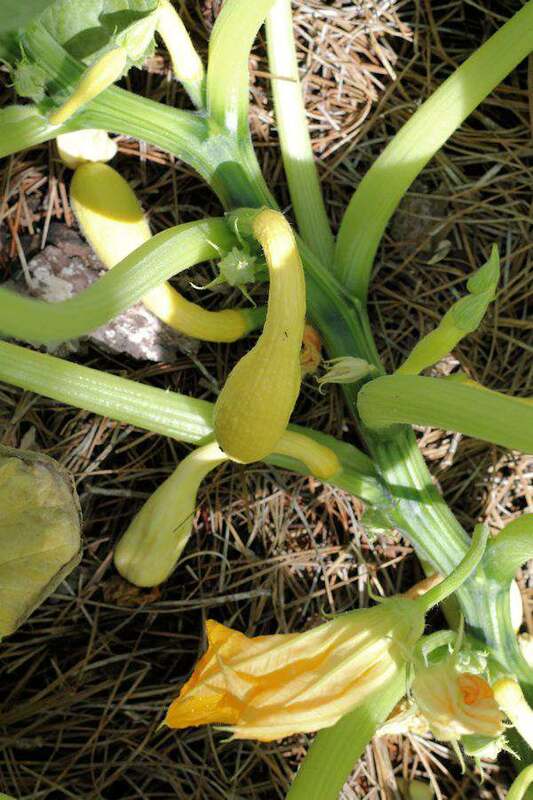 The worse of all my troubles is whats been going on with my cucumbers and squash plants. 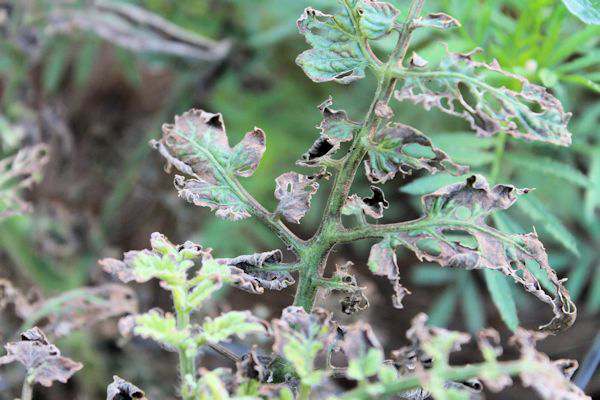 Its called Wilt Disease brought in by a beetle. You notice the stem near the ground and leaves just start wilting and turning brown. The fruit will just turn to mush. 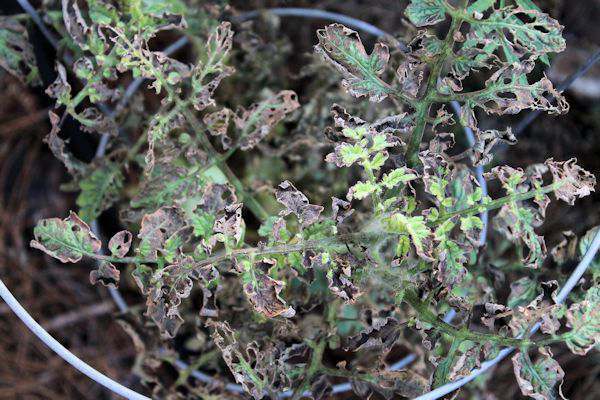 Once the plants have this wilt, you have to just remove the plant and throw away. 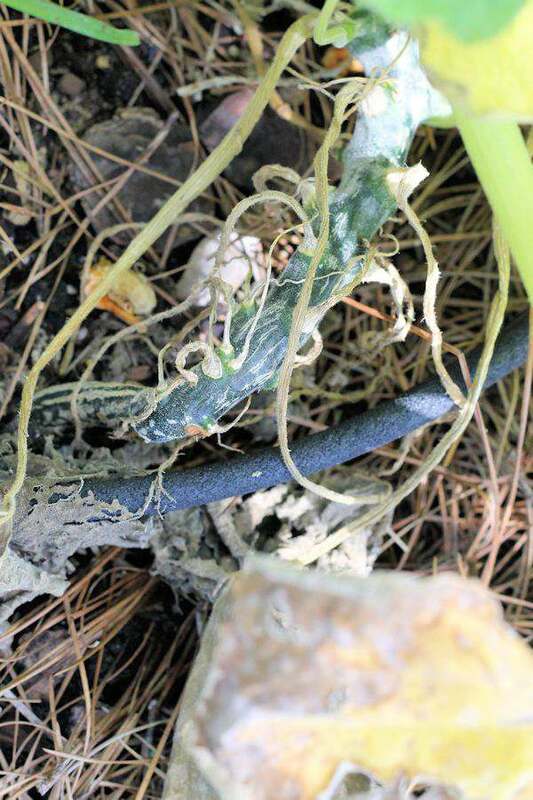 Don’t put it in your compost pile because the disease may hang around. There really isn’t anything you can do about this either because beetles are hard to kill organically. Even though there is fruit on the squash plant, within days of this picture, all the fruit had fallen off and everything was wilting. Mr. G was so looking forward to some fried squash. One thing I have learned is that using wilt resistant seeds that are self-pollinating will hold up well. So I will be trying a seed called County Fair and see what happens. They are a sterile plant, so you will never get seeds from the fruit. Now on to the good news of the garden. Even though watermelon is from the same family as cucumbers and squash, the cucumber beetle doesn’t care for it and I have a few watermelons growing very well. 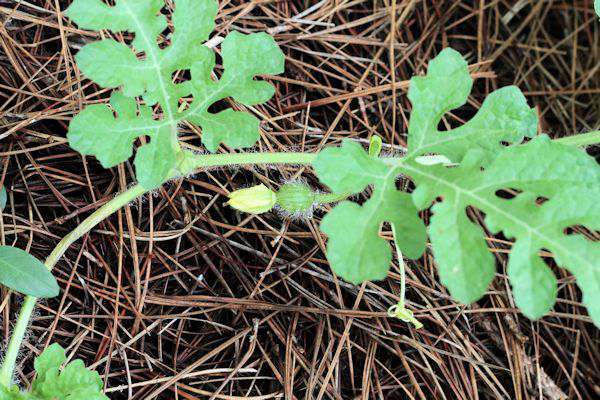 The variety is called Sugar Baby and makes a watermelon the size of a bowling ball. The main reason why I planted this variety. I have been keeping the vines from getting over 10 feet long to keep it contained. OH, how I love watermelon in the summertime. 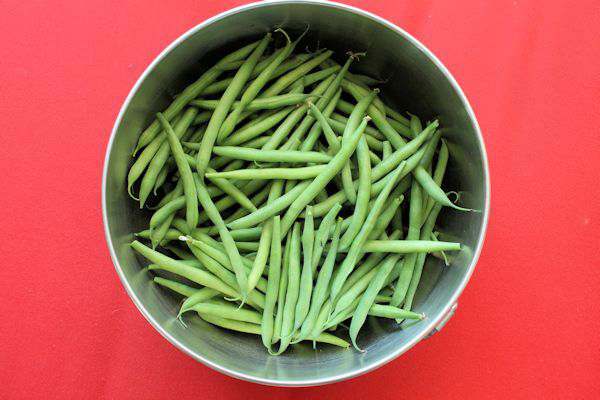 I didn’t plant very many bush beans and only got one mess to cook. So, next year, I will make longer rows and stagger plantings to get more beans for a longer period of time. There were no problems with my beans either. But it was a rather quick crop and I will plant again in the fall. 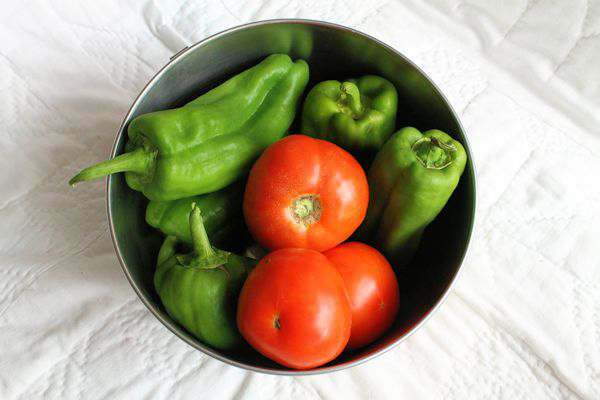 I was able to pick a few tomatoes before the Armyworms marched in and the green peppers are just doing so well. I can’t tell you how many peppers I have pulled off those 2 plants. I will post later how to freeze green peppers. Overall, I think my first year with this small garden has gone well. I am defiantly learning what changes to make for the next year. Oh Tammy I feel your pain, so far I have had slugs trying to eating everything, weevils larvae eating the roots of things and the neighbors cat deciding my raise beds looked like a nice toilet – the joys of gardening 🙂 But the hassle is worth it when you eat fresh strawberries or, the lettuce that made it. Thanks for stopping by Amber. 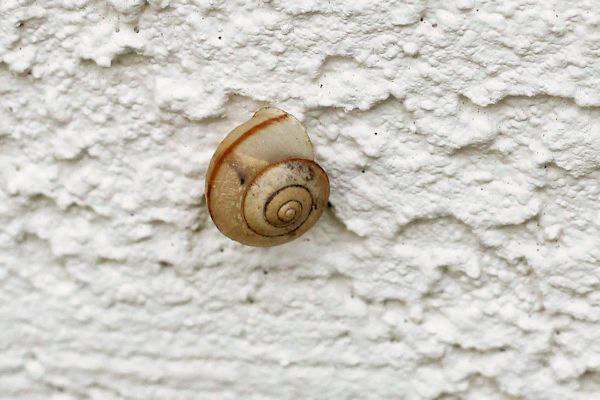 The snails have just been so bad this year. Thank goodness they are easy to get rid of. Just have to remember to put down the slug bait. Thank you so much for those kind words Karen. Even though I have gardened in the past in my home state of Missouri, gardening in Florida, is a whole different story. And its truly been a learning session so far this year. One thing about gardening in FL is you can have two seasons, spring and fall. So, I get 2 chances to fail or succeed. Hoping for much success. This is my first year of gardening in Florida and there are so many things to deal with here. The weather and all the bugs are the worse. But I am learning everyday wheat I need to do. Thanks for stopping by. Wonderful post, I love gardening. I’m going to pin it! Have a nice week. Dropping by from Mommy monday blog hop! Stopping over from the Mommy Monday hop! I hate when bugs/disease get a plant after putting so much work into it. Here in the north, we can get bugs, but animals get my plants more than bugs. I have beans growing this year! Hopefully, I’ll be able to post pictures soon. I had animal problems when I lived in Georgia. The dear and armadillos ate or dug up everything and we had to put out Coyote urine that came in a powder form. Now you can buy it at Walmart. Worked well. I had the worse time with pests the first year i started a container vegetable garden. This year has been better, hope the pests leave your beautiful veggies alone! Thank you Tanya. I’ve never seen Army worms here before but evidently if you have the right food, they will come.